Product #20615 | SKU 1SKB-TPX2 | 0.0 (no ratings yet) Thanks for your rating! The black Trap X2 Drum Case from SKB is a smaller version of SKB's TPX-1 Drum Case but remains a durable, rotationally molded polyethylene case that can be used for storage or transport of your valuable drums. The removable lid reveals a spacious interior that contains a removable tray used for hardware, sticks or base pedals. There's also an integrated cymbal vault that contains four pads to hold six 20" cymbals. The built-in 4" locking wheels provide easier maneuvering on stairs or backstage. The side lid handles make for easy lifting and rolling while the high-tension slide release buckle contains heavy-duty web straps for secure closure. SKB's Roto-X molding allows you to stack similar cases-a real bonus when traveling. 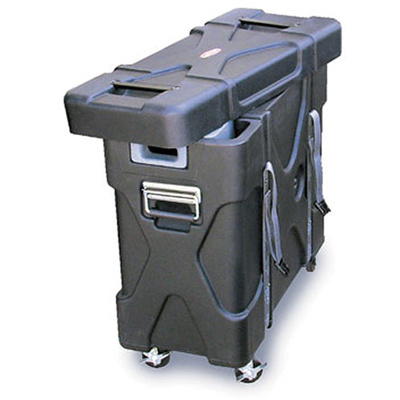 The top loading case contains sturdy dual cinch straps for secure closure.